Ryan Giggs OBE is a Manchester United football legend. Ryan made his first team appearance for Sir Alex Ferguson’s Red Devils aged just 17 in 1991. A member of the iconic ‘Class of 92‘ group of players, Giggs went onto make 693 appearances for the club over a 14 year period. With a record 34 career trophies to his name, Ryan is celebrated as the most decorated player the English Premier League has ever produced. In addition to the many football honours he’s received, in 2007 he was appointed an OBE for Services to Football. In 2013 Ryan Giggs was appointed as a player–coach at Man Utd under manager David Moyes. Giggs later took over as the club’s interim player-manager. On Louis van Gaal’s appointment as the new Man Utd manager, Giggs was appointed as Van Gaal’s assistant manager and experienced further success winning the 2014/15 FA Cup. As an international player, Giggs made his Wales debut against Germany in 1991. He went on to represent the Wales senior squad 66 times. Furthermore, he was named as the Captain of the Great Britain football team for the 2012 Summer Olympics. Giggs announced his retirement from the Wales squad in 2007, making his final appearance as Captain in 2008. However, 10 years later in 2018, Ryan was appointed manager for the Wales national team. Aside from being an incredibly successful sportsman, Ryan is also a very successful businessman, owning and co-owning a number of businesses including Cafe Football Restaurants, Hotel Football and Salford City Football Club. 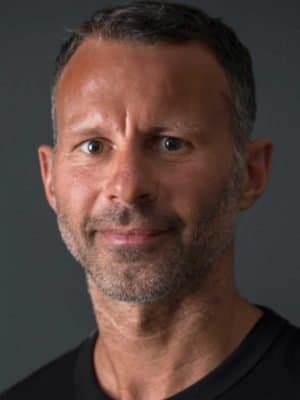 Ryan Giggs OBE is available for Q&A led after-dinner and keynote presentations.